West End Dumplings: The Castle of College Avenue (Part 1): The Biollo Family. The Castle of College Avenue (Part 1): The Biollo Family. Part 2: The Biollos' Fall. I love walking around Winnipeg's older neighbourhoods. It's the only way to get a true sense of a community, something you just can't get by whizzing by in a car or relying on media stereotypes. Even in areas known for being rough and tough you will find neat places. Pockets of neat, tidy homes with wonderful gardens, a commercial building plunked in the middle of a residential street, or truly unique house that, if in any other part of town, would be a celebrated address. 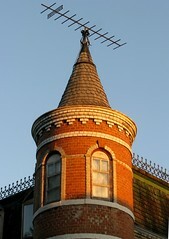 This is the story of the unique house, often referred to as "the Castle", at 494 College Avenue in the North End. The story of 494 College Avenue begins with the story of the Biollo Family's early years in Canada. Olivo Biollo came from Venice, Italy in 1902 and settled in Winnipeg. He quickly found work as a railway worker. Over the next couple of years his brothers, Angelo and Santi and their families, joined him. According to a family biography the brothers purchased the Savoy Hotel on Main Street and worked there. This was likely a very short experience as I can find no mention of them in Henderson Directories or period newspaper ads as being involved in the hotel. By 1904 Santi and Olivio worked as clerks at Cancilla and Co., a specialty food shop and restaurant run by Frank Cancilla at 251 Portage at Garry Street, (on the present site of the Paris Building.) By the end of the year, Olivio invested and it became known as Cancilla and Biollo and the restaurant Venice Restaurant. The restaurant received favourable reviews and the following year they expanded to nearly double the size. By 1905 Santi partnered with Givanni De Prado, who operated a steamship agency on Main Street, to open the Parisian Cafe at Portage Avenue at Smith Street. De Prado mysteriously disappeared in August 1906, apparently fleeing his debts so Santi carried on by himself. 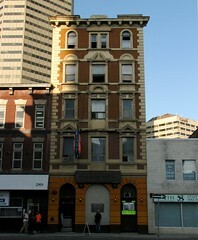 During this time, Olivia and Santi lived at a rooming house or SRO hotel located at 45 Portage Avenue at Main Street. Angleo is not listed in the 1904 or 1905 Henderson Directories. 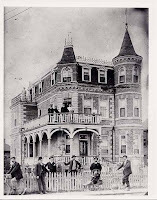 In April 1905 the brothers formed a partnership with other Italians, including a man named Ernesto Marchetti, called the Western Co-operative Construction Co. Their first project was the Mount Royal Hotel on Garry Street, today known as the the Garrick Hotel on Garry Street. (The architects were Smith and Bruce of Winnipeg). 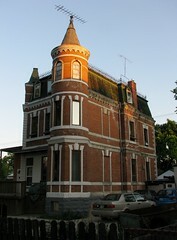 During, or just after, the construction of the Mount Royal, the same company built 494 College Avenue in 1906 - 07. You can see similarities in the brick and stone work. The three brothers and their families, (Olivio was the only unmarried brother, but got hitched in 1907), moved into 494 College in 1907, each taking up a floor. It's likely that neighbouring houses were build by Western Co-operative as well. From 1904 to 1907 the lots between 484 College to 502 College were empty. In short time, though, addresses from 484 up to 504 filled up with Italian surnames, including Ernesto Marchetti, a business partner in the construction firm. The brothers were living the immigrant's dream. They had come a very far way in just three years. Sadly, though, their Winnipeg dream would unravel in just a few months. In the tagged version of the above photo the Parisian is likely the low rise building in between the tags 'Free Press Sign' and 'YMCA / Birks Building'. For more about the Biollo Family, check out this family history. Great work! I await the conclusion of the story. Thanks ! It will be up after the weekend ! I am a direct descendant of the Biollo brothers.